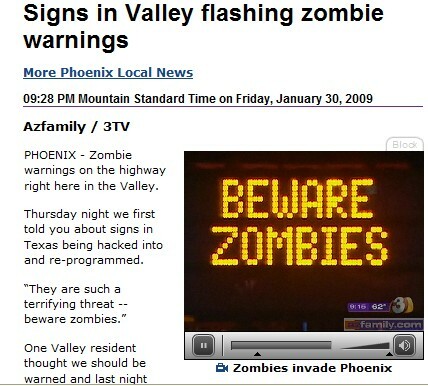 Apparently those naughty zombies are in Phoenix as well as Austin. 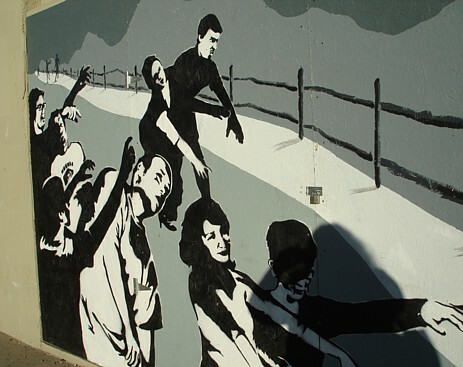 And so I've gotta ask: are the zombies specifically targeting Republican states? More to the point for me, is Tucson at risk as well? 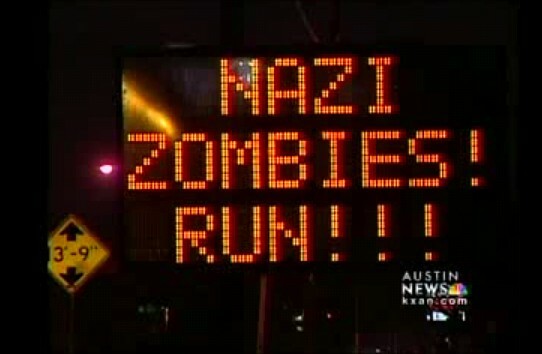 On the other hand, considering that the Austin sign warned of "Nazi Zombies," it's possible that the zombies are Republicans themselves. Be careful, folks. Already there are signs that certain Republicans are stumbling off in the wrong direction, oblivious to the needs of others, seeking the brains of the unwary. And some of them - Senator Kyl for example - live in Arizona. They start pestering me around three or four in the afternoon, sometimes earlier. By 4:30 or 4:45 they're frantic. Is it time for the dog park? Dogs don't know from lost jobs and online distractions. 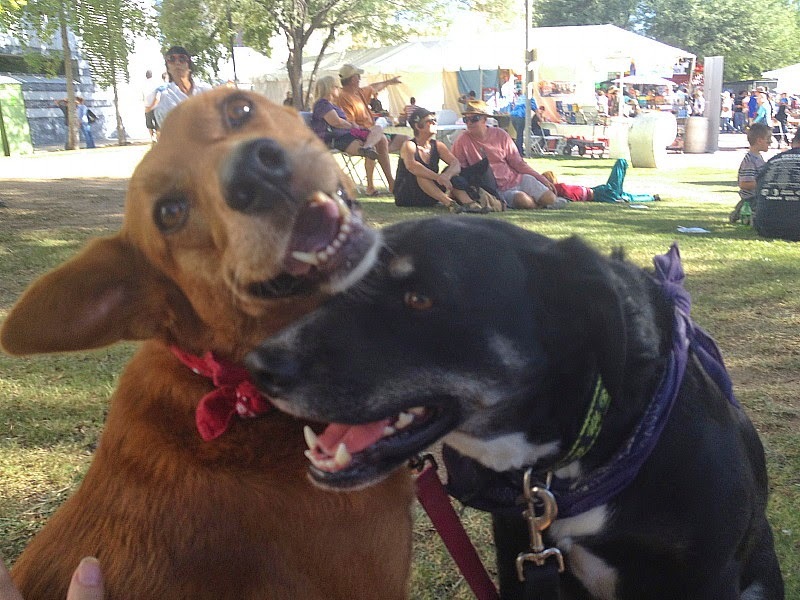 They don't even necessarily remember whether they got to the dog park yesterday. They only know that it's where they want to go today, and they won't relax until we've made the trip. Once we get in the car, there's no guarantee they will go directly where they want to go. Occasionally last fall we stopped off at the Democratic Party HQ first. A month or so ago on a chilly afternoon, I stopped at a 7-11 for hot chocolate. I didn't roll up my window when I got out (I can't open the car door with the window up - the inside handle is broken; plus the window itself isn't working properly). As I was paying, Cayenne turned up at the 7-11 entrance. To reassure the dogs that they are indeed going directly to the dog park, I've developed the silly habit of singing to them about where they're going. It's not a good or sophisticated song, but the dogs seem to like it, because it has those magic words that tell them we're going to the right place. 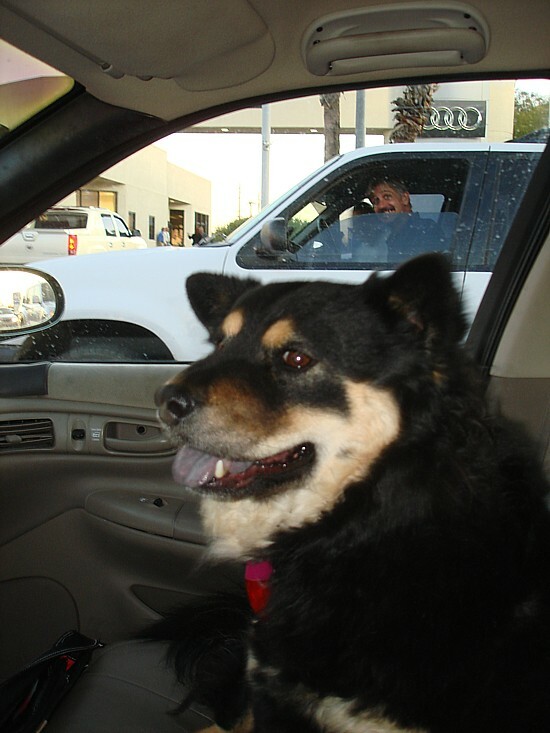 Pepper climbs into the front seat when she hears it (and sometimes crowds me as I drive, which is not so good). Cayenne sometimes licks my face as I sing. 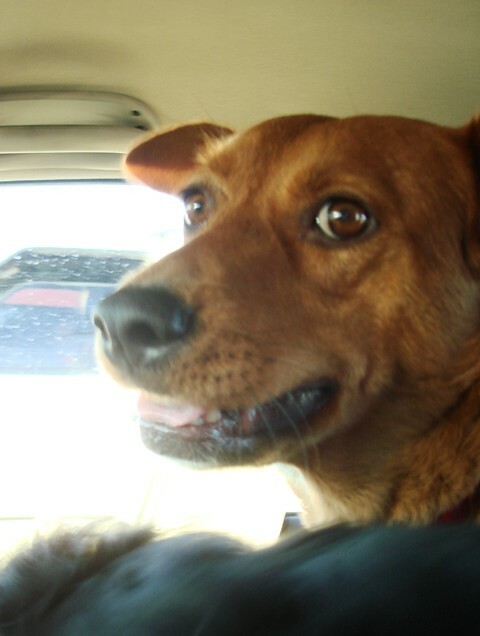 Going to the dog park with my dogs. Going to the dog park, dog, dog, dogs. 'Cause it's where my Pepper loves to bark. 'Cause she loves it even when it's dark. Told you it wasn't very good. It's only doggerel at best. But it's full of the words the dogs want to hear. I often improvise additional verses about the cross streets and the right turns and the golf course and the joggers as we drive by, but I don't attempt to memorize those parts. I hope the other driver didn't hear me singing! The dogs are in the car. I put on a show. Why I'd do such a thing! They may jump on the bed. And then they'll want their food. It needs a conclusion, but you get the idea. 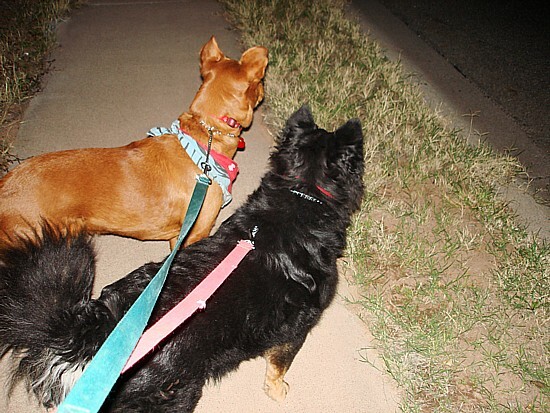 The point is, it's a fun way to manage doggies' expectations and anxieties until they are home and fed, and ready to relax. 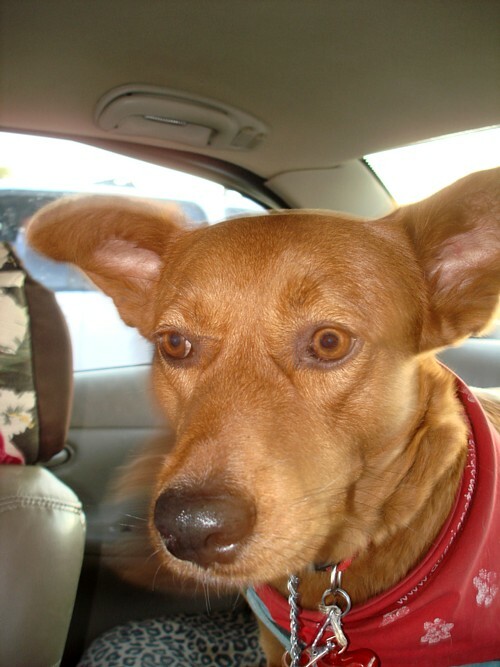 Check out Steven's (sometimes)photoblog each week to join in on all the petblogging, and for links to the participants. Last week, we welcomed our second guest professor, Laura of YBTN. This week our first guest professor, Florinda, is back with her second Weekend Assignment. Let’s see what it is! Weekend Assignment #253: You've got no electricity, no Internet, no phone, and no car for two whole days. What do you do with yourself? Extra Credit: What do you usually do in real life when an evening power shortage leaves you in the dark? No candles for the votives. I can't see having too much trouble in the daytime in this scenario. Oh, I'd fret about people being able to get in touch with me, but aside from that it would be fine. I'd grab a textbook and some recreational reading (novels and magazines) and maybe even a notebook to write in, and curl up in bed. The dogs would get lots of scratching, and it would all be very pleasant. Depending on what food was in the house and whether the gas stove was working, I might not have to venture out at all. Night, however, would be a major problem for me. That's when I'd be squirming, waiting to blog, wanting to mess around online and watch tv and get enough light going to do, well, anything at all. We used to keep votive candles around for Halloween jack-o-lanterns and Christmas luminaria, but we've used them all up and never remembered to buy more. So we can't light a single candle - we can only curse the darkness. Although...we do have this, a rechargeable flashlight that acts as a night light when not otherwise in use. That would help us move around a bit, but I imagine it wouldn't last two nights if it were on all evening. We had a power outage here a few weeks ago, and it drove me nuts. It was probably only for an hour or two, and very local - a cable failed at the nearby substation, affecting basically just our neighborhood. 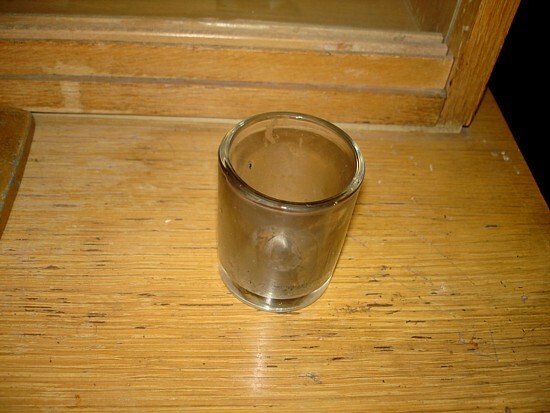 I checked again for a candle - no go. So I got out the flashlight, but that didn't open many options by way of activities. With no candles and no cable modem, the house was dark and a whole lot of no fun. It was early evening, so I wasn't going to bed. (Actually I tried for a nap, but it was hopeless.) I soon drove over to Borders, and worked on my computer (offline) until the battery rand low. When I got home, the power was back. I can stay in an indy book store until they throw me out. I will cop to B&N and Borders also, but only when I am looking for an old classic or a just new must read. 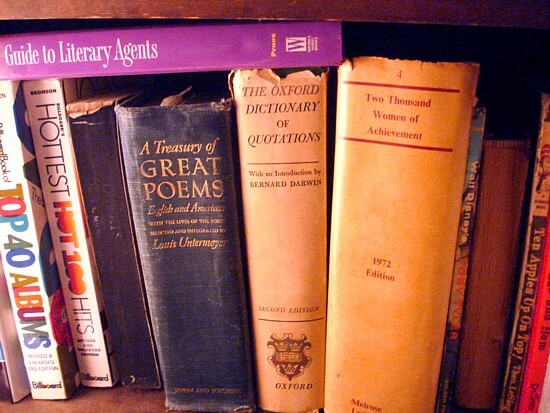 I once went to Boston for an estate sale just because they listed: LOTS OF OLD BOOKS. Running medical practices in the past I received many health related books that were better than I thought they'd be from drug reps. There is a Catholic thrift shop in my area that I go to about 4 times a year since people drop some good finds there, not many, but enough to make me visit on occasion and pick up some good reads. *smiling* I enjoyed those books by by Patricia C Wrede and Caroline Stevermer too! I get most of my books from Amazon and our local Half Price Books (which I am starting to feel slightly guilty about since, as an author, I deprive my fellow writer of her $1, but....) I love to haunt antique stores in search of first editions or just interesting editions. I found one last week called Don't Blame The Mirror. It's a 1960s beauty guide that is hilarious. I also found a copy of Tom Sawyer by Samuel Clemens (before he started publishing under Mark Twain) and picked it up for $4. I have a passion for old books. I used to go to Ft. Worth every year for a used book sale. They had the most amazing stuff. I think the most I ever spent was $40, but for that I got a whole armload of rare books. My favorite place to acquire books - and I'm a book buyer more than a borrower - is my local Borders. It's on the small side as those stores go, but it's nicely laid out for browsing. The "literature" section is a bit of a catch-all, as was recently discussed on someone else's blog (I'd link if I could remember where it happened - sorry!) - memoirs and essays are often shelved there, mixed in among classic and contemporary non-genre fiction. I get the majority of my books from the library, because I just don't have enough room in my tiny apartment to keep a lot of books. I have over a thousand books in storage as it is, and I just can't bring myself to add more while leaving my old, well-loved books all alone in boxes in a storage unit. It just isn't fair. I wish I had some cool place to list like a fun independent bookstore, but I don't. Actually, I wish there was a place like that around me. Especially one that specialized in genre fiction, but I don't know of one. Anyone know of a store like that in the northwest suburbs of Chicago? Maybe I just missed it. I do most of my buying at local thrift shops, and second hand book stores, depending on what I am looking for. With thrift shops I peruse the aisles filling my basket with whatever looks good until there's no more room in the basket or no more money for more books. I love to read, so there is a great deal that will interest me. Those Nancy Drew covers are identical to the editions I would get for Christmas in the early 70s. Yellow borders and all. Neat! That's it for now. Assuming you're not trapped in the dark without a connection, I hope you'll participate in this Weekend Assignment. And yes, I'm still soliciting your suggestions for future Weekend Assignment topics. Email me your ideas at mavarin@aol.com anytime. If I use your topic you'll get full credit and my undying thanks. And thanks to Florinda and Laura for three great Assignments in a row! 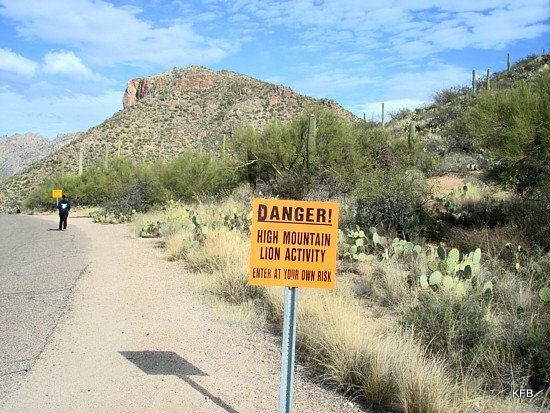 Here's the end of my photo tour of Lower Sabino Canyon; and not a day too soon! Tomorrow night is the Weekend Assignment, and I just got the email for my online FAR (Financial Accounting and Reporting) seminar's first assignment, due in a couple of days. Wait, haven't we been here before? Yes. I just about killed myself struggling through most of the first assignment for the 41-day version of the seminar, only to drop it in favor of this later 61-day version. Reason: I got a job and couldn't handle the heavier workload of the shorter seminar at the same time. Now I'm jobless again, and the coursework will be heavy but doable. Well, anyway. Back to Sabino! 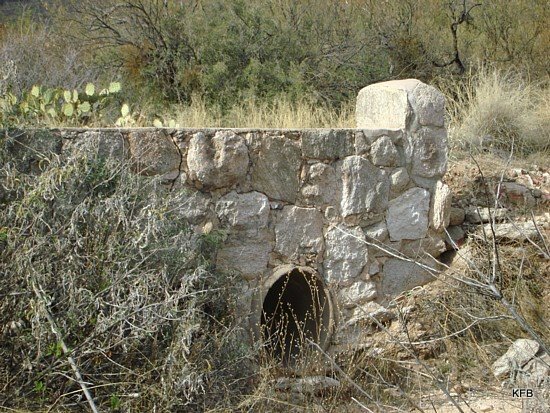 Let's start here, at a stone wall within a few hundred feet of Sabino Dam. My rocky trail started to run parallel to a road after about 0.4 miles, right by a convenient restroom building, with modern plumbing and everything. 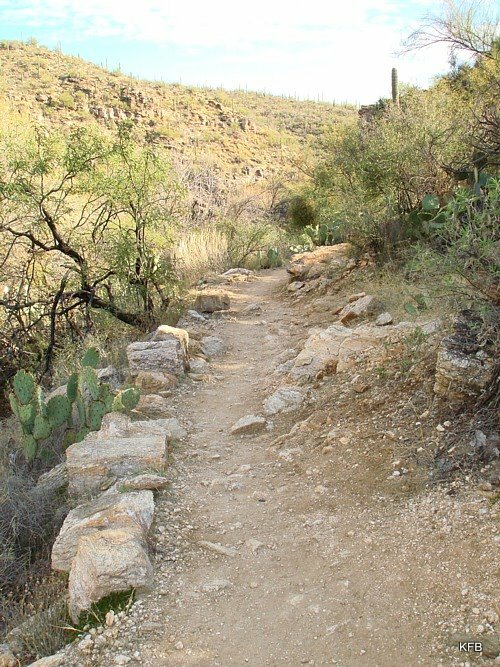 The side path to the restroom, it turned out, led toward Sabino Dam itself, which the main trail only looked upon from a distance, it turns out. The trail led past this nice old stone wall, and also some of that nasty orange netting as a temporary fence nearby. Surprisingly, there was no wall or fence when I reached the actual dam. I could have waded right into the water at the top of it. Of course, this would be a very bad idea, especially in January. Here's another angle on the dam. That path makes it look as though people actually do go down to the water to wade. And now you see why I think wading at that spot I photographed earlier would be a bad idea, even in summer. It would be like swimming in the river just above a waterfall! Then again, I've actually swum in waterfalls before - Buttermilk Falls (probably the one outside Ithaca NY) and at least one little waterfall in the Adirondacks somewhere. After that it was another half mile or so to the end of Bluff Trail, which deadends into Bear Canyon Trail. It was about 4 PM by then, and shadows were getting longer. 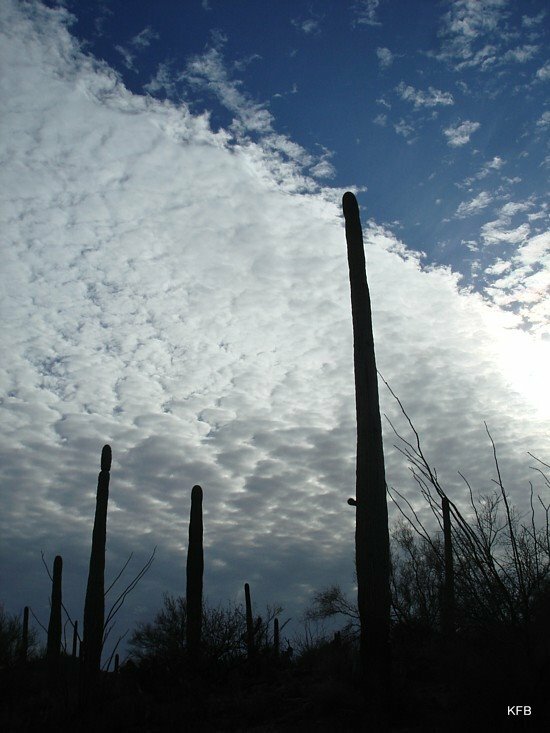 I love the way the saguaros I photographed along the way were silhouetted beneath a patchwork of little white clouds. Here's one more shot for Carly's "Rocks or Stones" theme. I love the way someone placed different colored rocks along the top of this wall when it was built in the 1930s (probably). Were they being artistic, or just having fun? The Bear Canyon trail at the end was desert scrub and grassland, with (unfortunately) private homes to the south of it, but an excellent view of the mountains to the northwest. I'm not going to show you any more photos in this entry, because I'm overloading the blog as it is, especially for those of you who are still on dial-up. 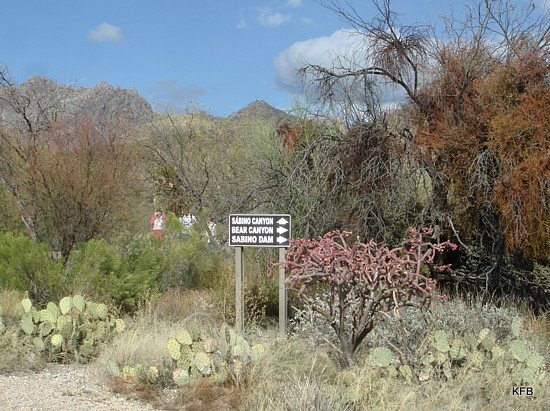 But you may want to check out my Picasa album of the Sabino Canyon day trip for lots more photos of this beautiful place. Once I made my overly cautious way down the first step of Bluff Trail, the downward grade turned out to be more reasonable than I originally thought. 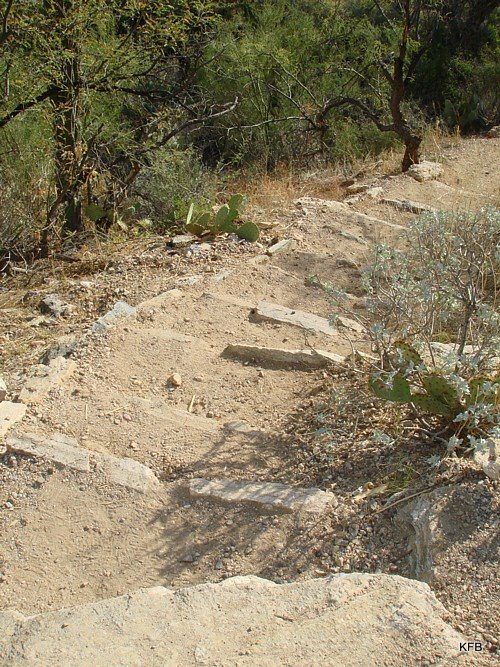 It made its way up and down through the foothills of Sabino Canyon, not attempting to be the easiest or fastest possible route, but not being particularly devious or rugged, either. I spent most of the long walk panting, but my exercise-induced asthma never kicked in, and after a while my legs were pleasantly sore. Soon the trail overlooked Sabino Creek on my left, which briefly widened into Sabino Lake. A couple of guys were down by the water on the other side by way of a different trail, but on my side it was a long way down. I stayed on the heights and kept going. One of the more interesting and picturesque moments along the trail came not from the water on my left, but from the rock formations right in front of me, soon to be next to me and directly overhead. The trail got a little steep and tricky here, and I picked my way a bit. But it was well worth it for the view and the photos. Meanwhile, though, the lake on my left opened out into a small sandy beach. 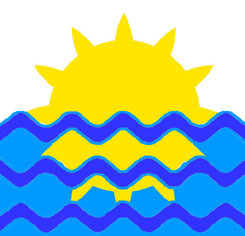 Tucsonans sometimes joke about Sabino Canyon being the only place in the area where one can go to the beach. In fact in summer, people sometimes do go wading. 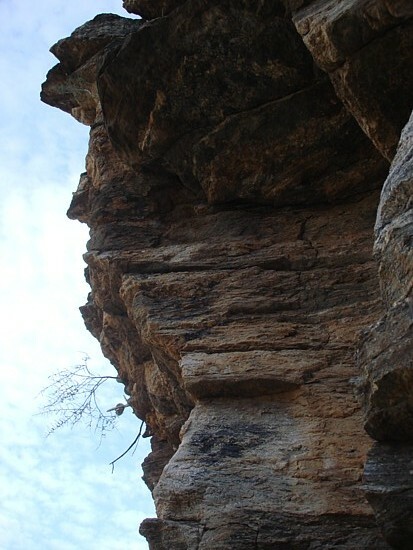 Here is one of the stone outcroppings along the trail, with a bird's nest on a sapling growing out the side of it. At first I accidentally saved this picture with the bird's nest on top. I still think it looks better that way. A good look at the outcropping as I went past it made me almost wish I could try rock climbing someday. But even if I had the nerve, which I clearly don't, my poor coordination and often-injured ankles would make such an activity a very bad idea. Guess I'll settle for walking past the rocks instead, on a well-defined nature trail. Here's the view looking back. I still have more photos I want to show you, but I don't want to overload any one entry. We'll get to the dam and the home stretch tomorrow night. See you then! Last night when I read Carly's EMPS assignment, Rocks Or Stones, I knew where I wanted to go, but not whether I could do it. That question was answered at 8:05 AM Monday. My recruiter called to say that the CPA firm that hired me last week emailed that they were indeed pulling out of the location where I was working. I'm unemployed again. I'm disappointed about this, and a little worried, but not devastated. The silver lining, at least for the day, was that I could indulge in a fairly ambitious rockhunting excursion. 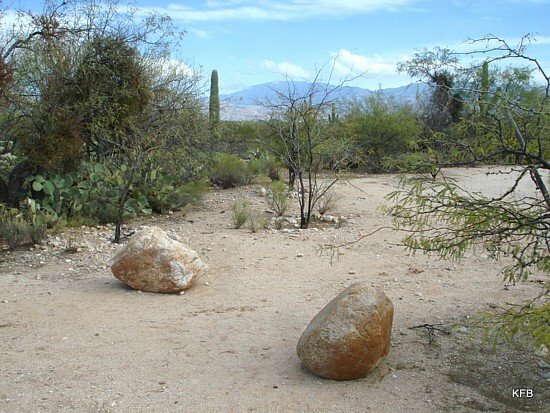 The Santa Catalina Mountains are a collection of rocks. A mountain, if you think about it, is essentially a really big rock with bits broken off and stuff growing out of it. So I headed for the mountains. 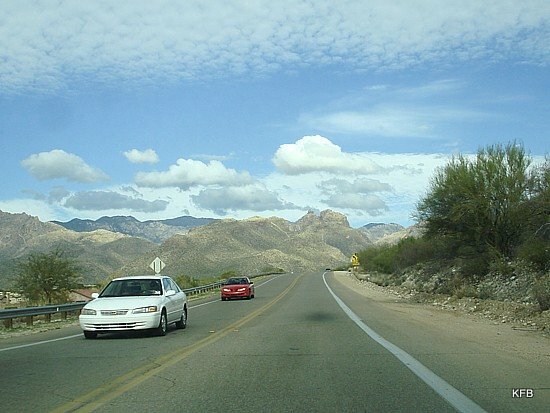 I've done this before for other photo challenges, but usually I've taken Catalina Highway up Mount Lemmon. This time I had a different destination in mind. 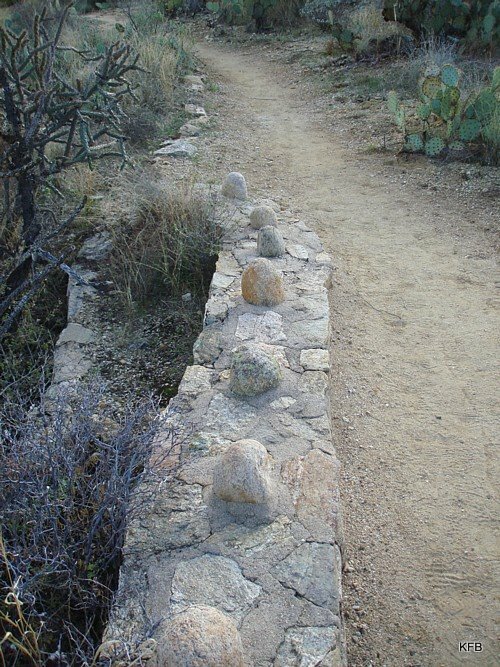 "Salt potato rocks" along Sabino Walkway. 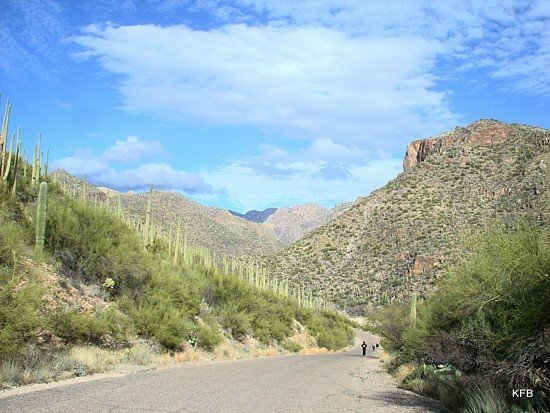 Here we are in Sabino Canyon Recreation Area, part of the Coronado National Forest. I used to come here several times a week in 1986, when I was new to Tucson and vaguely working on a book about local Critters. It's probably been well over a decade since my last visit, and I've been meaning to go for some time. 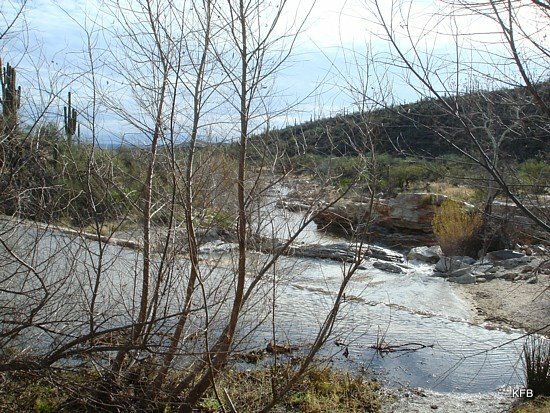 Sabino Canyon is only about ten miles from my house, and it's a beautiful place. I've also been interested in checking on its recovery from a major flood in 2006, which took out one of the nine stone bridges along the 3.8 mile, pedestrians-and-official-vehicles-only road. I saw little evidence of the damage today, largely because I didn't stick to the main road. I took a few of the trails instead - over two miles' worth. That doesn't sound impressive until you look at the terrain I covered, which I'll be showing you over the next few nights. 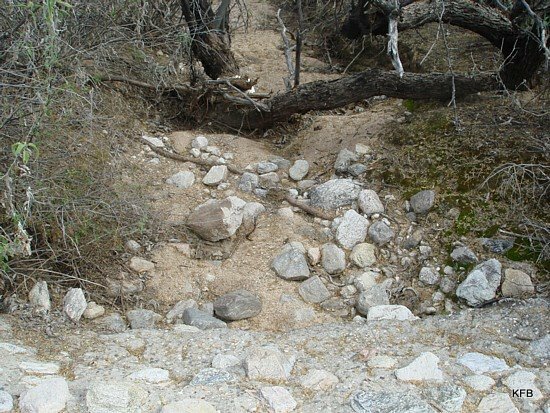 Rocks abound, especially in creek beds, making for natural building material. 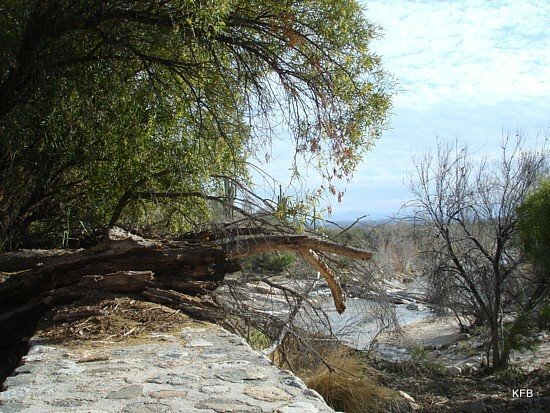 The roads, bridges and buildings of Sabino Canyon were built by three Depression-era agencies: the Emergency Relief Administration (ERA), the Works Progress Administration (WPA) and the Civilian Conservation Corp (CCC). Between 1933 and 1937 they built roads, bridges (originally called "check dams"), picnic tables, fireplaces, restrooms, a ranger station and a few other large buildings, mostly out of stone. Many of these are still around, but some were destroyed or damaged in the flood. 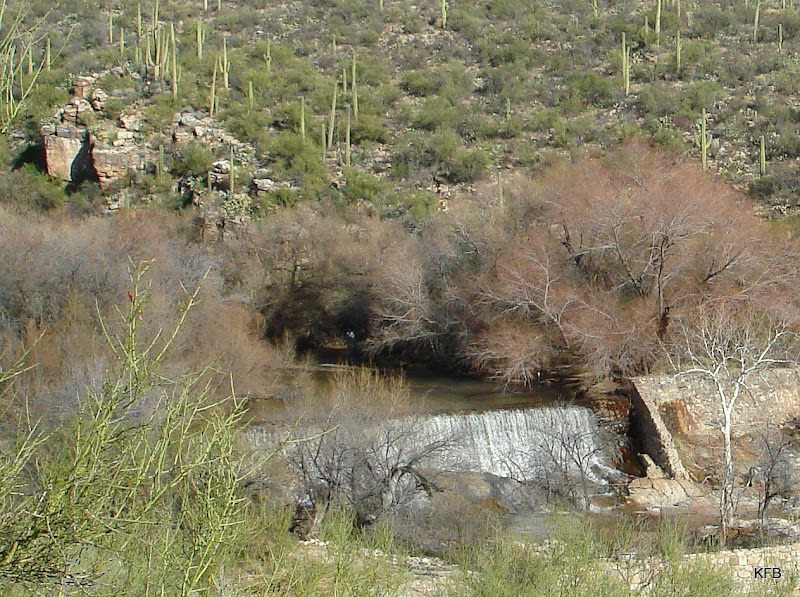 But a group called Friends of Sabino Canyon has been working to preserve and restore as much as possible. One of the nine stone bridges on the main road. Back in 1986, I used to occasionally take the tram to the top of the road, back when it cost (if I recall correctly) $3. 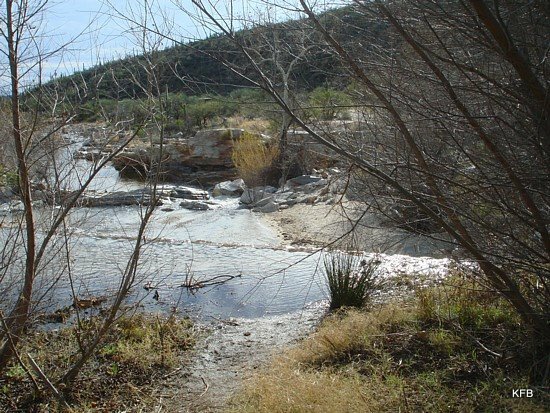 Later I used to stick to the Lower Sabino Canyon and Bear Canyon area. Prices have gone up over the years, of course. Admission used to be free, and now there's a use fee. I bought an annual pass for not much more, so I can start coming here often - not as much as in 1986, but enough to make the pass worthwhile. I did not spring for the tram ride, which is now $8. A rock. 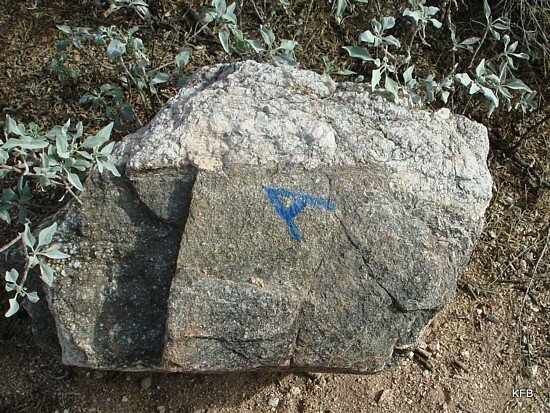 Not exactly an ancient petroglyph! 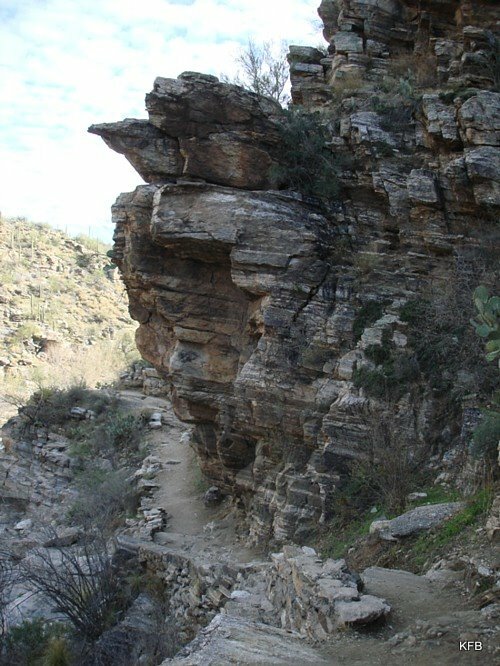 I started out on a trail to the right of Upper Sabino Canyon Road, called Sabino Walkway on the map. It ran parallel to the road for half a mile, and most of the many walkers and hikers were using the road instead. But I stayed on the trail, taking pictures of rocks and desert and phainopeplas, a kind of bird that lives on mistletoe berries. It had been chilly in the city, but once I got going I was warm enough to stuff my jacket into my oversize purse, and use the latter as a knapsack. 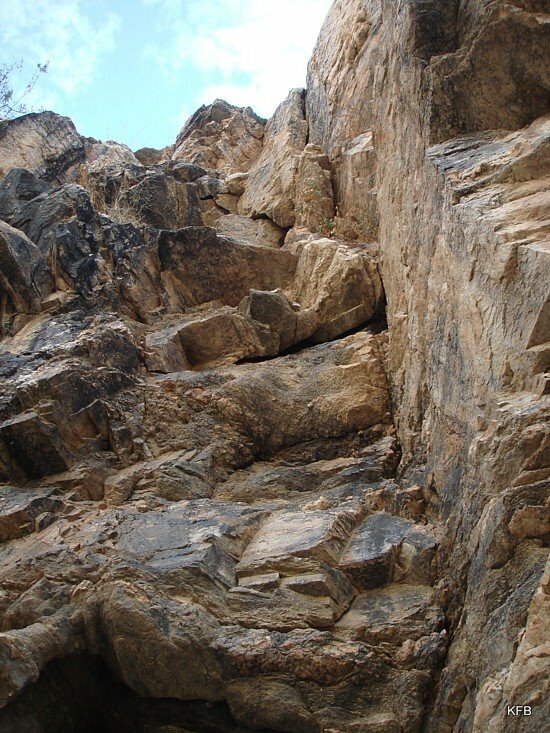 A route to the Dam - but not the best route. When I crossed Bear Canyon Road I saw this sign, and asked a couple of middle-aged hikers for advice. 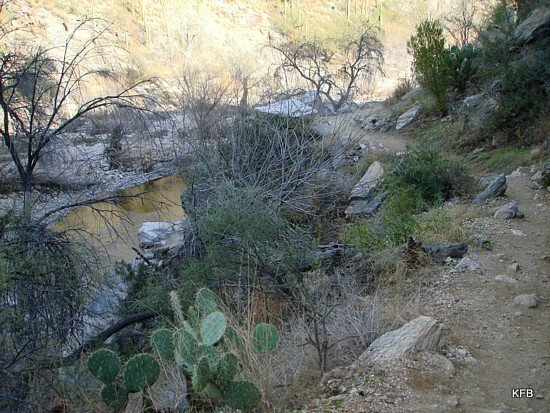 They suggested that I should keep going, and then take the main road to another trail that went down toward Sabino Dam on the right. "There's plenty of water down there," they promised. No, I wasn't eaten by a mountain lion. I followed their directions, and soon passed a very different sort of sign. Right after this, the road dipped rather steeply downhill, and before too long I reached Bluff Trail. This photo doesn't really convey the angle of descent. 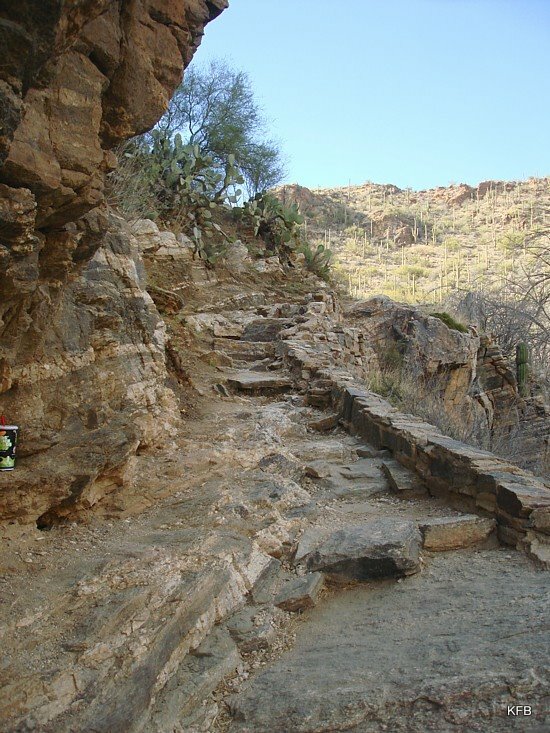 The steep beginning of it, which I remember taking on a regular basis when I was two decades younger, was a little daunting for someone who has had several seriously sprained and broken ankles since then, and done precious little hiking in recent years. But the couple I'd spoken to had been unconcerned about my ability to handle the trail, and the memory of my younger self pushed me on. After the first step, the initial stretch of the trail wasn't so bad. And after that? It got modestly hairy at times, but the spectacular views made up for it. But you'll have to wait to see those tomorrow night, and possibly the next as well. In which I'm sucked into a book and rant about a key. I think of nothing but the book. Blame it on Davies and on Cook. Dang, it's late. Give me easy access to a book I've waited months to read, and suddenly it's three and a half hours later. A Writer's Tale by Russell T Davies and Benjamin Cook came out in the UK in September, at which time some fascinating excerpts appeared online and in the UK press. In theory it was supposed to reach the US version of Amazon in late November, but it was delayed. 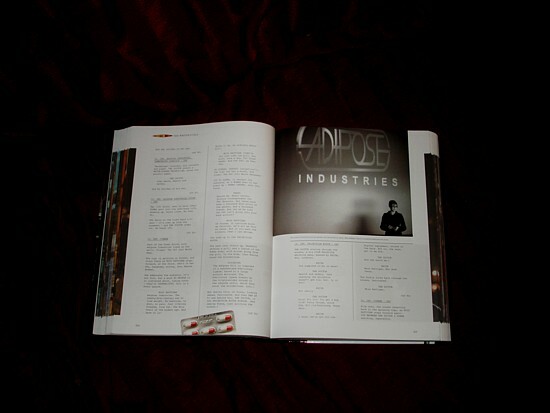 I don't remember exactly when it finally came, but within a day John was reading it too. It got to be a pain to keep track of where I was in the book and where John had set it down last, so left it in John's care. Yesterday he said, "I thought you were finished with it." No, John. I was a little over 100 pages into this 500 page book! So today he finally finished it, and tonight I assumed custody, found my place and started reading. That's why it's 2 AM at this moment. I was supposed to go grocery shopping, but I wanted to read a little more first about the rewriting of early Series Four Doctor Who scripts. Then it was 11:45 PM and Safeway was closing in 15 minutes, and I didn't want to go to the store and so I didn't. This is the way a really good book is for me. The fact that I still haven't finished reading Jonathan Strange and Mr Norrell after at least a month, more likely two months, says less about the book's page count than its ability to hold my interest. Oh, it's amusing, cleverly written and original, but I don't actually like the characters much, and for me that's just about fatal. This non-fiction tome I'm reading now, on the other hand, is full of engaging characters. Not only is it laced with chunks of Doctor Who script in various stages of completion, but the screenwriter and the journalist whose emails form the bulk of the book also become characters, sometimes outrageous but eminently likable. But the book isn't the only reason I still haven't made the rounds of the Robins or studied accounting or washed my hair and gone to bed. There was an annual meeting at St. Michael's today, and I was briefly on the hook as a possible vestry member before slipping away because people sensibly voted for someone else. After church I spent a few hours trying to tweak the church's online presence some more, which included starting a Facebook group for St. Michael's. 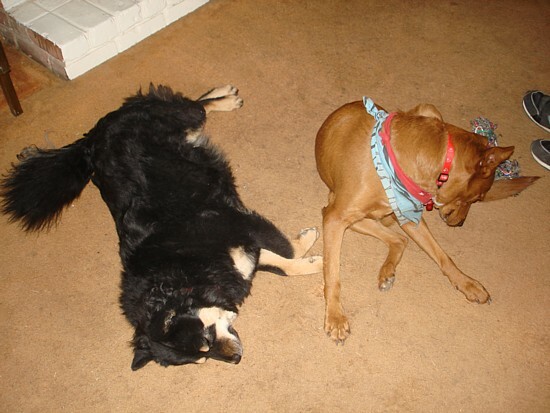 Then I wrote up the entry on the Round Robin blog, for which I tried to incite the dogs to joyous behavior on camera, because the topic is abut joy and happiness. That didn't work out too well, and it wasn't fair to delay any further the thing that was really making the dogs happy: an imminent trip to the dog park. So off we went. The cat in our yard went this way! Let go of the leashes! Half an hour laster, I set off to go buy dinner, and I couldn't find my key! No, that's not a typo. It's just one key, on one of those fobs that lock and unlock the car. I used that key to drive home, so it absolutely, positively must be here somewhere. But I've searched my desk, the counter, the floor, the bathroom, the couch, the front room, the car, and the front yard. With flashlight. Repeatedly. I haven't found it. The best I can figure is I lost hold of it while trying to keep the dogs from chasing the cat. Let that be a lesson to me. What kind of lesson, I've no idea. We'll see whether it turns up readily by daylight, and where. It's even possible that the key got hooked to Cayenne's or Pepper's collar, and was then dropped in the back yard. 2:27. I'd better get the hair washed and go to bed. I have to work in the morning. Probably. Tomorrow night: the Ellipsis Monday Photo Shoot, news on my key and my job, and my comments to Round Robin blog entries. See you then! Update (copied from Twitter via Facebook): Guessed wrong. I'm unemployed again after all. Should make for interesting form-filling on the unemployment claims website. As in, "I'm employed and I'm hopeful." Tools of my trade, such as they are. There was a time, back when I was in college the first time in the 1970s, that the word "hopefully" was horribly overused, especially in the sense "It is to be hoped that" (or simply "I hope that"). Like many English major types, I was annoyed for years when I saw or heard sentences that started, "Hopefully we will...." But eventually I read in the Harper Dictionary of Contemporary Usage that the construction has a long history, and is not actually incorrect. So I'm using it here, both in the sense "I hope I'm still employed" and in the sense "employed and hopeful." See, on Friday I was told there was a chance that the CPA firm would drop the location I'm working at, eliminating my job in the process. This was primarily because the company owners were concerned about the same situation I wrote about on Wednesday night, with some sort of security breach and the police being called to the premises. Both professional ethics and liability issues require that the firm and its employees avoid getting entangled with a company where something nefarious is going on. This week's events understandably raised such concerns. But the end of the workday came, and I received no phone call relaying any further news. 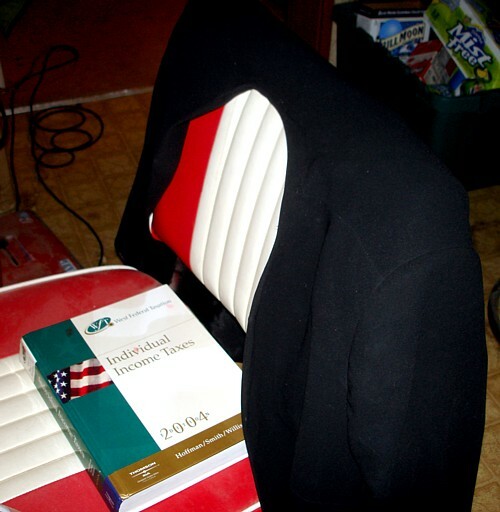 So today, Saturday, I went over to the location to make sure my desk is still there, to pick up my tax accounting textbook just in case, and to check in with the guy who does the Friday and Saturday shifts. 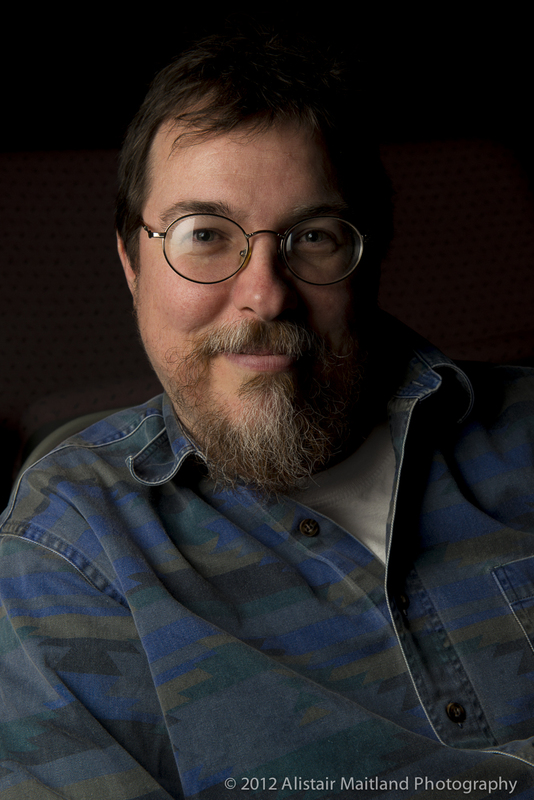 He was very upbeat and reassuring, and gave me some much-needed perspective. It turns out that nobody else is far ahead of me in training for the job or doing any actual tax returns; most people don't have their W-2s and 1099s yet, and everyone, including the company, is still getting everything up and running. It also appears that my employment situation strongly resembles that of other people hired by the company for seasonal tax work. I've now met two of them, and like me, they both had been looking for work since September. I'm the only one of the three with an actual accounting degree, but my two coworkers have more actual tax experience. B. today also told me that one of the other people at the brief training session had previously interviewed him for another position, before losing her own job as a company controller. It's a tough market out there right now! My main disadvantage on the present job is that I don't have much experience with other people's taxes, but I have several safety nets to make up for this: the tax software, my determination to learn as much as possible about income, adjustments, deductions, credits and filing options, and the fact that each completed return is checked over by one of the owners before e-filing. Aside from all the obvious advantages the latter offers in terms of quality control for the company and the clients, it protects the company from any dishonest practices a seasonal employee might attempt. My coworker today told me that as recently as February of last year, one Tucson location of a very well-known tax firm was shut down for fraud. I'm grateful that my employers are being diligent in preventing any similar occurrence. As for the incident on Wednesday, my coworker had not heard about the police involvement, but he was aware that something had happened. The working theory that emerges from our discussion is that a disgruntled employee did something - stole from them, perhaps, and possibly did a little sabotage. Obviously that employee is gone, and everything seemed to be running smoothly when I stopped by today. If the CPA firm has no reason to believe there are lingering security or legal issues (e.g. any illegality on the part of the check cashing service itself), then there is no reason not to continue at the location. This would appear to mean I still have a job. I may even learn to like it! I'm not put off by the relative solitude, and I've done customer service before - two decades ago, but still, I should be able to cope. I like everyone I've met from the CPA firm, and I'm certain I can learn what I need to know. I just need to train myself in a few areas, and get through a few actual returns. Once I do that, my diligence and confidence should see me through, all the way to April 15th. I hope! For Carly's Round Robin Challenge: Not Of This Season, I present echos of baseball season. And I'm not talking about just any baseball season. No, I'm referring to the summer of 1993 - and the summer of 2009. Rainclouds completely obscure the mountains in the January rain. Until late this afternoon, I was stumped on this Round Robin topic. 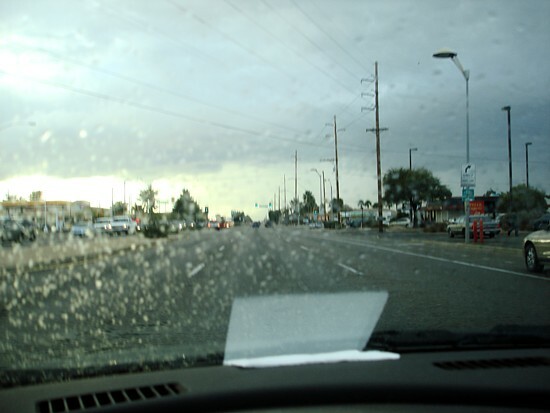 Tucson was doing what Tucson nearly always does in January: getting a little winter rain in to hold us until the summer monsoon. 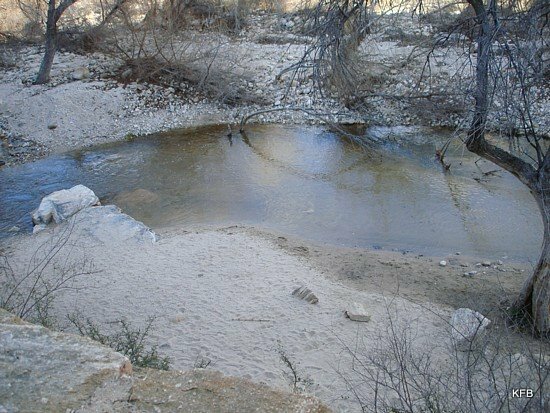 (Tucson averages just under an inch of rain in January, a bit less in February and March, just a quarter inch in April through June, and then over two inches a month during the summer monsoon.) 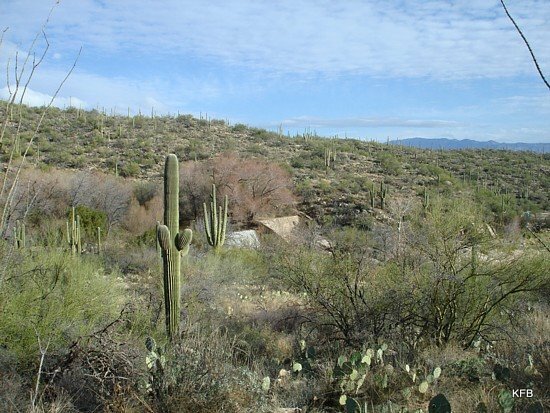 Frankly, a picture of Tucson in January looks an awful lot like a picture of Tucson in July. So how was I going to show something unseasonal in a place that barely has any seasons? The humans get under cover from the rain - Pepper, not so much. 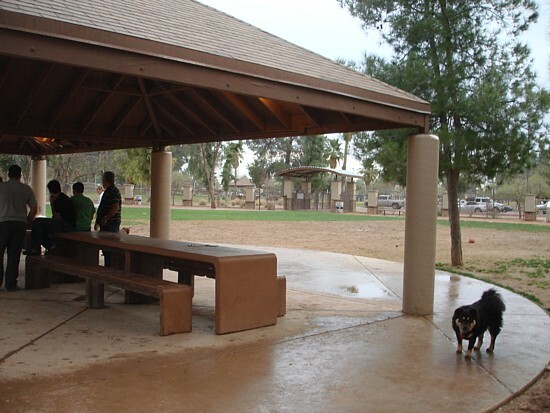 Then as I got near the dog park, I thought of Hi Corbett Field, which is also in Reid Park. Yeah! January is definitely not baseball season, but tickets for Rockies spring training are already on sale. Sure enough, there were people in the box office. But that's not what got me excited. 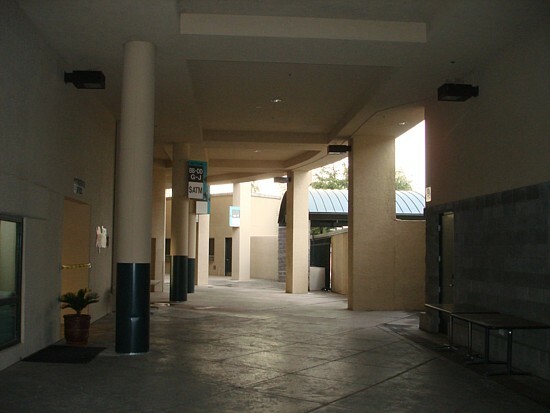 Welcome back, Toros! How I've missed you! 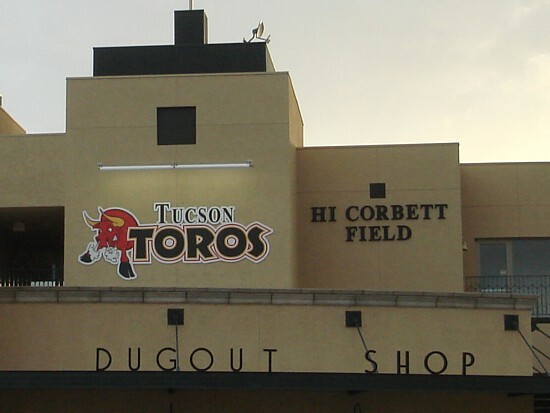 This is what got me all emotional: a Tucson Toros logo, adorning the Hi Corbett wall for the first time in over a decade. My favorite team is back! Sort of. 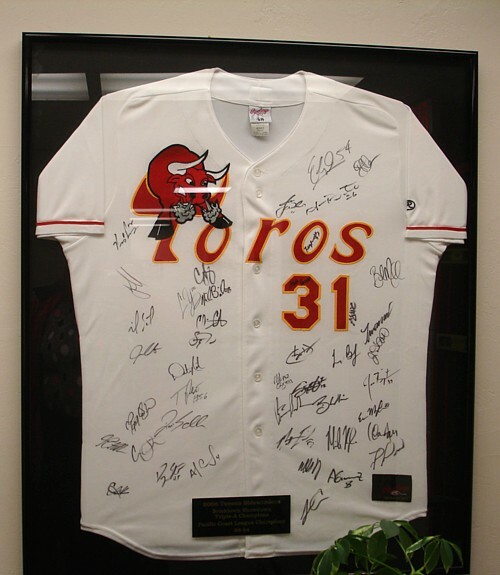 1993 Toros team autographs on a 1993 jersey in the 2009 Toros office. This being only January, they're not really back yet, and when they do get here in May it won't really be them. The name is right. The venue is right. The colors are right. But the old Toros, the version that won Pacific Coast League championships in 1991 and 1993, were the AAA affiliates of the Houston Astros. 1993 was the year I discovered baseball, when John and I attended one game as a rut-breaker and liked it a lot. So we went to a ton of games over the next several years, and I got to do a lot of interesting things as a Toros fan, including being (at different times) guest scorekeeper, guest color announcer and guest interviewer. 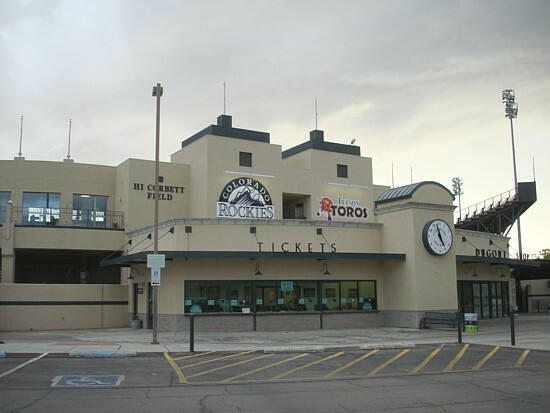 Through a complex series of events, the Toros morphed into the Tucson Sidewinders in the late 1990s, with the wrong venue, the wrong colors, wrong just about everything. We stopped going to games, and so did a lot of other fans. 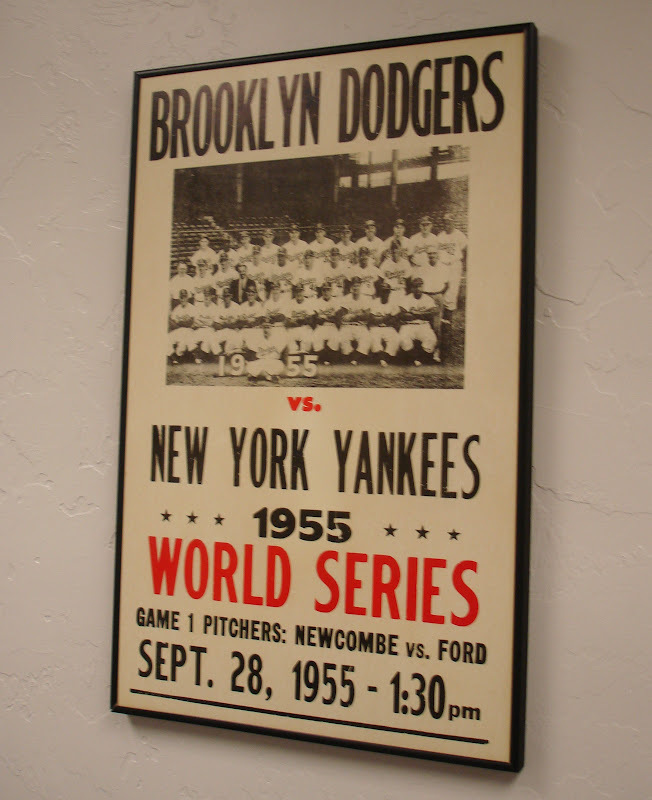 Now the Sidewinders have gone off to Reno, and Tucson will have the new Toros, part of the independent Golden Baseball League. giveaways, waiting for autographs, even a brief stint as team webmaster. Nevertheless, I was inspired to go ask when Toros tickets go on sale, despite the fact that it was almost 5 PM and the ticket office was about to close. They directed me into the unlit concourse and through an unmarked door on the inner wall: the once and future Toros office. I met a couple of nice people there, chatted briefly, looked at a seat map and took a few pictures. Season tickets and packages (basically ticket books) are already on sale, but not single game tickets. "They don't start playing until May, so check back with us in April," I was told. Still. The Toros! Hi Corbett! Tuffy the Toro, the team mascot for which my recently deceased dog was named! Huzzah! But the day wasn't done showing me unseasonable things to show you. 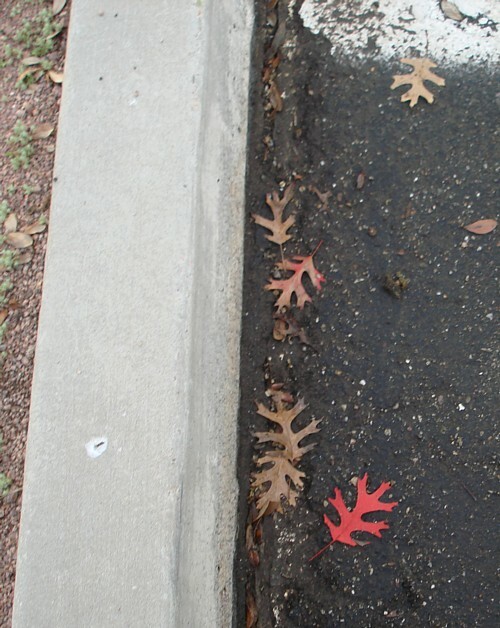 Tucson gets almost no fall leaves, but a leaf on the ground in the Hi Corbett parking lot was so red I thought for a moment it was printed on paper for a promotion of some sort. Nope. It was a real fall leaf - in Tucson! In January! I thought of you, Jama, and knew you'd want to see it. And later we went out to my favorite Chinese restaurant (Peking Palace) to celebrate my new job, even though I got word today that I may be unemployed again by Monday. 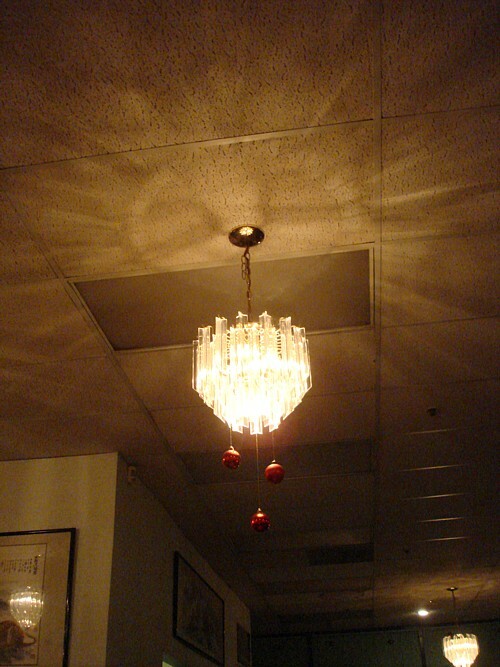 They still had Christmas ornaments hanging from their chandeliers. Maybe they plan to keep them up because they're pretty. I'm really happy with the photo because of the light pattern on the ceiling looking like a smiling summer sun. gwenlyn **Welcome New Member** - Posted! Chris**Welcome New Member** - Posted! How about you? Are you playing along this week? Check the Round Robin blog for info on how to join in. That's never out of season. Last week, we welcomed our first guest "professor," Florinda, who provided us with assigner Weekend Assignment #251: Fantasy Sabbatical. This week, let's dip into the suggestion list from another guest "professor," Laura of YBTN. Both the main question and the extra credit are hers, as we return to a favorite subject for some of us: books! Weekend Assignment #252: Where do you get books from? Extra Credit: What was the last book you read, and why? Mind you, I'm hoping for something more interesting than five people posting the word "Amazon." Let's consider more than just our #1 current bookseller, shall we? I'll start. 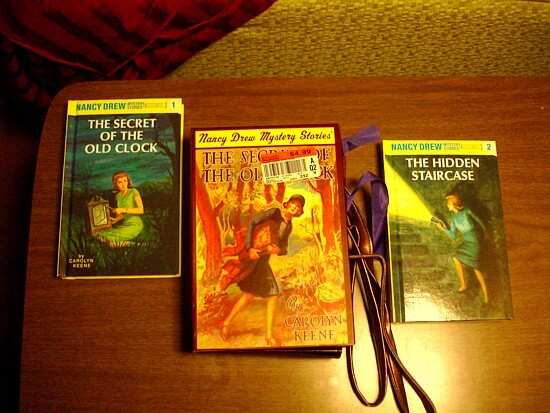 It's sort of a purse-thing, a slipcase with purple ribbon ties and patent leather handles, containing the first two Nancy Drew books. I first read The Secret of the Old Clock and The Hidden Staircase approximately 32 years ago, and I'm curious to see what I'll make of this edition. The illustrations look more 1940s-1950s than 1930 (when it was first published) or 1960s or later. But I'm sure I remember wondering what a "roadster" was. This edition calls Nancy's car a "convertible." There must be lots of books in my collection from B&N and Borders, Amazon and even Costco; but the older volumes tend to have a very different provenance. I spent a good chunk of the 1970s buying paperbacks (Star Trek books, Harlan Ellison and Ballantine Adult Fantasy) from my local Waldenbooks, a Manlius drugstore or one of the bookstores around Syracuse University. More interesting, perhaps, are the ones I either inherited or raided from my parents' library: the Who's Who-type books my mom was in, my favorite poetry collection, the Robert Frost book that once had a love poem hidden in it (not shown here), and an Ogden Nash collection with the spine missing. After I met John in 1977, the book-collecting became more serious and more diverse in its sources. We scoured thrift shops and used bookstores and library sales, all over the country. 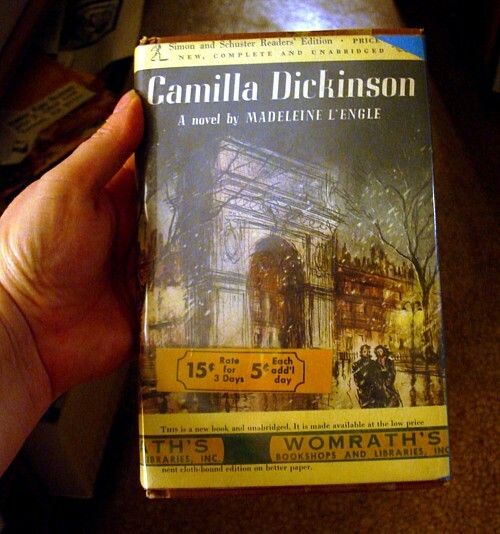 Here's one of my rarer L'Engle books, clearly ex-library, but not a conventional library. Before Herman Franz of Utica, NY bought it outright, this 1951 first edition was apparently available as a rental. I don;t actually remember where I found this book, but I think it may have been at a book sale in Ohio! On the extra credit, I'm trying to remember the last book I actually finished reading. It's probably The Grand Tour, by Patricia C Wrede and Caroline Stevermer. In September when I found myself jobless, I found some excuse (a rediscovered gift card, perhaps?) to buy a new edition of Sorcery and Cecilia, or The Enchanted Chocolate Pot. This in turn enabled me to read its sequel, The Grand Tour, which I bought some time ago while waiting to purchase one of the later Harry Potter books at midnight. Since reading those two books back to back (and they cheered me up immensely at the time) I've been wanting to read the third in the series, The Mislaid Magician, or Ten Years After. The fact that the latter book arrived from Amazon just before I get my new job gives this extra credit paragraph a nice symmetry, don't you think? I think you need that 6 months. There are a couple of dad's friends whom I'd take in if I had a free 6 months. Seriously, I'd like to do a book about England and/or Europe, so that sort of leaves out the beach stuff, unless I were to spend a lot of time along the Mediterranean. But even more seriously, that's not where I'd want to spend all of my time. To begin with, I think I would opt for a major change of scenery, and spend my six months' leave in the opposite corner of the country - New England. I lived in Connecticut until I was twelve, but have barely been back there since my family moved south. However, my home base for the period would be my favorite East Coast city, Boston (don't tell that to my birthplace, New York, though). So where would I spend it? With my camera in a rental car (a comfortable rental car!) - traveling all around the United States. Why drive? More often than not, the best trips I have taken in my life have been road trips. That's it for now. Assuming you're not too busy reading, I hope you'll turn up here to tell us about your preferred book suppliers for this Weekend Assignment. And yes, I'm still soliciting your suggestions for future Weekend Assignment topics. Email me your ideas at mavarin@aol.com anytime. If I use your topic you'll get full credit and my undying thanks. And thanks to Florinda and Laura for two great Assignments in a row! You would not believe the day I'm having. It's a tale of police action, mystery and intrigue. Blog at 11. via Twitter - 1:07pm. So. The work day is 10 AM to 7 PM, four days a week, and four hours elsewhere on Friday. I caught the lights wrong this morning, and it was about 10:01 when I reached the storefront's door. It was locked. Someone inside eventually came over, told me they were closed due to some unspecified problem, and would reopen in an hour. I should come back then. Uh, okay. I called my recruiter to let him know, rushed home, gave my dogs a very brief, unscheduled morning trip to the dog park, rushed home again, and returned to the store at 10:59 AM. There were two police cars outside. I sat in my car and watched them coming and going from that same door I'd stood at an hour earlier. My recruiter agreed with me that it probably wasn't a good idea to walk in myself at that point. He made some phone calls for me, and was told approximately nothing. Fair enough; it's none of my business what "issue" the check cashing business was having. I don't work for them. But it was disconcerting. My recruiter suggested that I go to lunch and then return to work. By this time, I was having a bit of a stress reaction, which pretty much kept me from lingering over lunch. Half a sandwich later, I returned. Still two police cars. "Go shopping," my recruiter advised. "Buy yourself something at Macy's." I went to a store called Catherine's instead. I found career slacks that both fit well and have pockets, something I needed rather badly. From there I went on to Barnes and Noble, where I ran into Kevin and told him about my day so far. He was agog. Back at the storefront, one cop was still there. I left a phone message for my recruiter and went home. That's when I posted that tweet that has so singularly failed to grab your attention. While I was home, a potential employer who first called me on the land line before Christmas (a call I failed to return until after New Year's) called me. He had a job opening at a hospital in the Arizona boonies. I mean, even boonier than the other job. Was I interested? I checked Google Maps. It's not sure there is such a place, but if there is, it's about 90 minutes from my house. I called John. "Absolutely not," he said. "Too much wear and tear on the car." So much for that. Just before 1 PM, I called my recruiter yet again, and was connected with one of my other recruiters from the same business. She checked for me, and the answer came back: ignore the police and return to work. So I drove back to work. No police car. No sign that anything whatsoever had happened. No comment, no verbal acknowledgment that I was making a late start on the day, nothing. Aside from a brief, pleasant meeting with someone from the CPA firm, who brought me a tax book, supplies and instructions, I spent the rest of the day tackling the most difficult of the practice returns. I was determined to figure out the complexities of self employment, a home office, MACRS depreciation and other aspects of company car expenses. It was a lot of fun, and I mean that without irony or sarcasm. Here's hoping that the most exciting part of my job tomorrow will involve practice returns, or possibly the successful completion of a return for my first real-life tax client. Am I ready for that? Gulp! The day just past was one of those Where-were-you-when/I'll-never-forget-that days. I've lived through a number of them. Most of them were times when we were blindsided by bad news: assassinations, attacks, natural and technological disasters. This was a rare happy one, the happiest one in decades. the new President's central message of hope and service. This time we saw it coming. 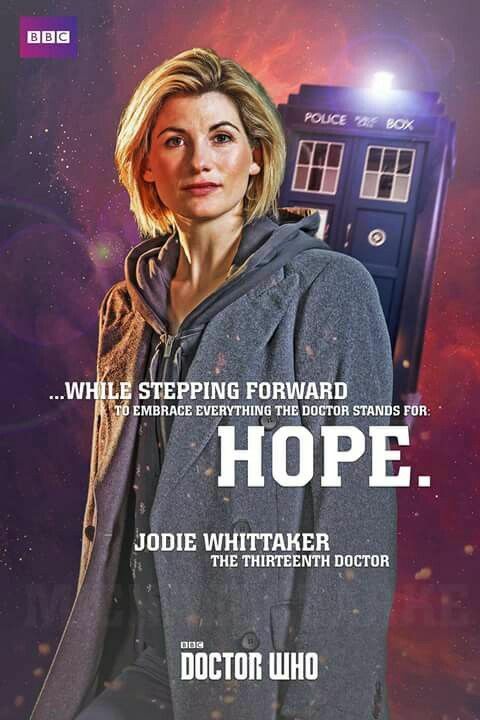 A few people of hope and courage and vision and chutzpah saw it coming two years ago. I hoped I saw it on the horizon four years ago, when a guy with a weird name gave an amazing speech at the Democratic convention. But I also distinctly remember being outside Trader Joe's about two years ago, weighing Obama and Clinton's respective electability. I was desperately worried that neither of them could win in 2008, neither the inspiring black guy nor a woman who had been targeted by right-wingers for years and years. I'm delighted that Barack Obama exceeded my hopes and confounded my fears. Hopes and fears aside, though, we've known today was coming for ten weeks now. We've counted down to this joyous moment with eyes wide open, looking for the end of one phase of history and the beginning of another. A couple million people, perhaps, flocked to see the focal point of this moment, in person or on Jumbotron. Many people who couldn't get to Washington DC gathered elsewhere, determined to participate in our shared history. Still others settled for being connected by TV, by Internet, by Twitter and Facebook and iPhone. 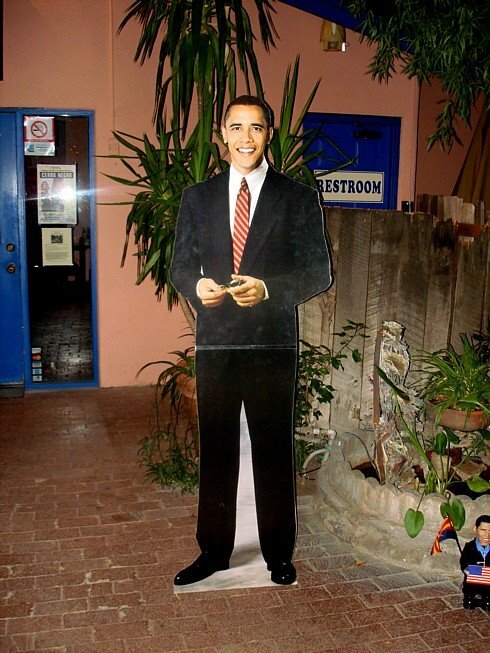 I've never seen the man in person, only his cardboard stand-in. And where was I as Barack Obama officially started his new job? I was starting mine. I was sitting at a locked desk in a small storefront, unaware that the desk key was in what I'd just been handed by a woman locked behind glass. I had turned on the computer in front of me, but there was little indication it was booting up. Even if I did, I had no prayer of watching the inauguration or inaugural speech on it. I didn't have the passwords for it yet. And, as it turns out, the computer has no speakers whatsoever. You don't need audio to do someone's taxes. A long way from Washington, but history is here, too. 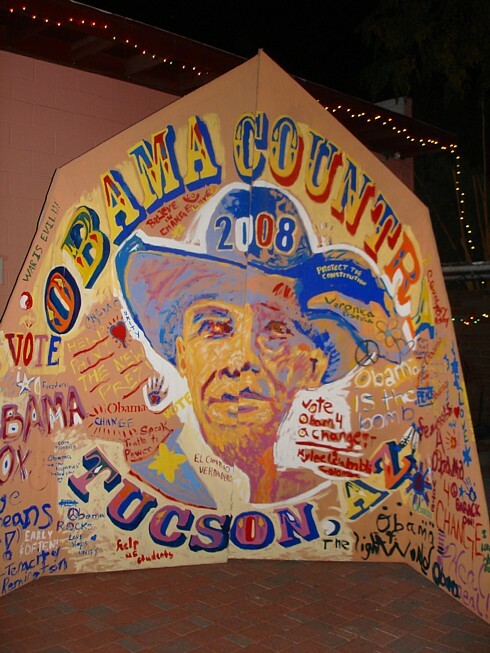 All day, as people came and went in the small storefront, cashing checks, paying bills and mostly ignoring me, I did not hear one person mention President Obama, or the amazing thing that had just happened three thousand miles away. People were too busy getting on with their lives, dealing with their personal finances, trying to survive. 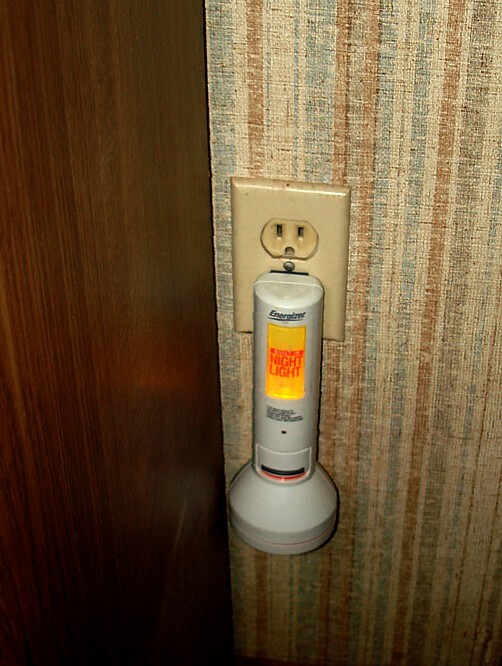 Maybe they had watched tv or listened to the radio before walking in. Maybe they cared deeply, but a check cashing service wasn't the place to mention it. Or maybe the daily stresses of life and money obscured their vision. Maybe they weren't looking at the past ending or the promise of the future. My new job puts me in contact with people who need the change that this day portends as much as anyone. It's not going to be accomplished tomorrow; nor did our new President promise that it would come without hard work, communal and individual effort. As someone who just started a new, temporary job after being out of work for four months, I was never going to be one of the people on the National Mall. I am unlikely to help build a house for Habitat for Humanity. Heck, I didn't even manage to give blood yesterday. But today was a start in my trying to give honest effort to a job that at least relieves the State of Arizona of the burden of paying me $240 a week. 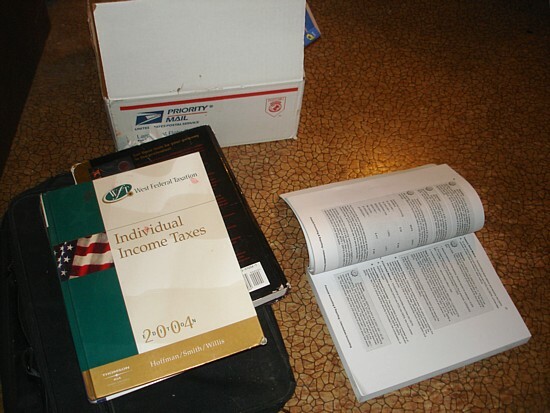 I hope to get up to speed soon on this tax stuff, and to do a good job for people who need help with their returns. It's not charity, it's not glamorous, and frankly I'm still nervous about learning to be both confident and competent. I'm going to have to overcome my shyness to do this well. That may be my personal improvement project of the next few months, at least as much as studying for the CPA exam. Maybe I'm not really partiking in history, except as one of the rabble, as much as everyone else who walks into that storefront, just another person struggling in a tough economy. But this bit part is not the role of victim. 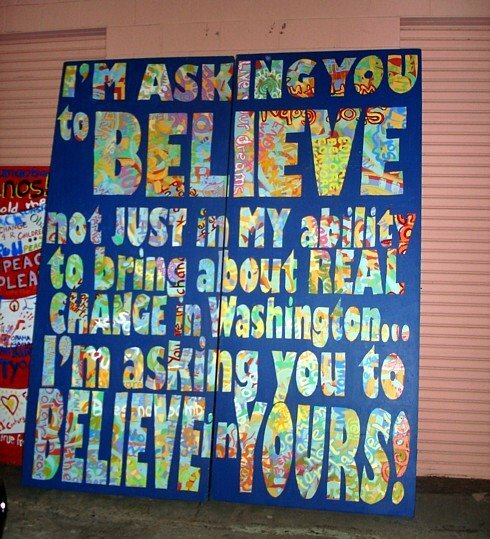 Because like the people on the Mall today, I'm looking forward, eyes wide open. I can see better times ahead, and I'm willing to work for them. EMPS: Ah, Youth! Back When They Were Youthier! How Desperate Do I Need to Be? Weekend Assignment #250: Hot or Cold? The Moment Has Been Prepared For.